Generating equal sized polygons along line with PyQGIS? I would like to create polygons along a line to use them for AtlasCreator in a next step. ArcMap has a tool called Strip Map Index Features. With this tool I can choose the height and width of my polygons (say 8km x 4km) and produce/rotate them along the line automatically. One of the generated attributes of each polygon is the rotation angle that I need to rotate my north arrows in Atlas Generator afterwards. Does anyone have an idea how to solve this task in QGIS / with pyQGIS? Grass- or SAGA-algorithms or a prossessing-toolbox-model which could be used inside a custom plugin would be fine, too ;) Edit1: I need not only the print extents but also the polygons itself as I want to print a map with all polygons/extents as some sort of overview map. Interesting question! It's something I've wanted to try myself, so gave it a go. You can do this in PostGRES/POSTGIS with a function which generates a set of polygons. In my case, I have a table with one feature (a MULTILINESTRING) which represents a railway line. It needs to use a CRS in meters, I'm using osgb (27700). I've done 4km x 2km 'pages'. 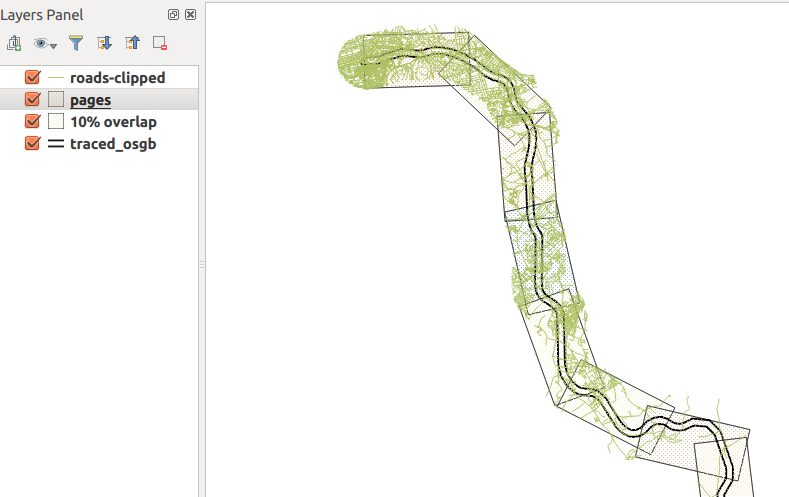 Here, you can see the result...the green stuff is the road network, clipped to a 1km buffer around the railway, which corresponds to the height of the polygons nicely. -- replace this with your table. -- I have absolutely no idea how this bit works. It's a bit hacked-together, and only had a chance to test on one dataset. Not 100% sure which two vertices you'll need to choose on that bearing attribute update query.. might need to experiment. I must confess I have no idea why I need to do such a convoluted formula to rotate the polygon to match the current line segment. I thought I could use the output from ST_Azimuth() in ST_Rotate(), but seemingly not. Perform new loop and reset dict x,y,id to generate next polygon object. You can change this proposition if it is not really clear or comment. print "Geometry type should be a LineString"
The two answers (at the time of posting) are ingenious and well explained. However, there is also a VERY simple but effective solution possible for this (assuming you will accept all your maps aligned with North up in the traditional way, rather than a random North direction based on the river). If you want rotations, it is possible but a little more complex (see bottom). First have a look at my post here. This gives you a how-to for creating map coverages for Atlas. The method you want is an adaptation of is 'Workflow 2' in the how-to. Split your linear feature by vertices or length and buffer the features by any amount. The amount you buffer by will partially dictate the overlap (but see below) but more importantly, it creates a feature with an area. You can use any number of plugins to split the lines but the GRASS v.split.length and v.split.vert are good options (available in Processing Toolbox). Having enabled Atlas Generation in Map Composer and selected your buffered layer, switch back to the items tab and select your map object. Check 'Controlled by Atlas', and in your use case, I would opt for Margin around feature. This will control your overlap between maps (alternatively you may prefer fixed scale). You can preview you Atlas using the Preview Atlas Button in the composer's top toolbar and see how many pages it will produce. Note you can choose to export all pages in a single PDF or as separate files. To get the map to rotate along the line, there is a rotation field in the Map Composer Item properties. You will need to set an expression (use the little button to the right of the rotation box). Select variable as your option and then Edit. An expression builder will popup and in there you can access the geometry or fields of the atlas features. You can then build an express to rotate the map according to the rotation of the features (you can calculate the bearing using the start and end points of each line segment and a bit of trig). Repeat the same process to rotate your North arrow (using the same expression or pre-calculated variable). Not the answer you're looking for? Browse other questions tagged pyqgis grass qgis-processing saga strip-map or ask your own question. How to set up a Coverage Layer for Atlas Plugin? Avoiding overlap when creating many fixed sized buffers with PyQGIS? How to assign raster values to lines with PyQGIS functionalities? Adding line sinuosity with PyQGIS?